Featured in Grocery Dive, Vivaldi Partner Pete Killian published an original piece that addresses Amazon’s strategic challenges and examines the ways in which competitors can not only catch up to Amazon, but win a higher share of future growth. Read on to find out how retailers can leapfrog the e-commerce giant by offering a mission-specific shopping experience, implementing private brand architecture, and committing to a specific brand promise. Amazon’s recent earnings report shows growth slowing in multiple categories, including food. Physical store sales — the majority of which are Whole Foods locations — were down 3% in the most recent quarter versus last year, and while Amazon’s online food sales are still growing rapidly, that growth rate has declined -25%. A $700 billion market in the U.S. alone, grocery is critical to Amazon’s continued rapid growth and keeping its Prime members loyal. Many of Amazon’s food challenges are well-covered, notably in fresh food credibility and building bigger baskets. But Amazon’s challenges in food run at a deeper strategic level: a one-size-fits-all experience, private brand anarchy, and lack of an overall brand promise in food. Each of these challenges represents an opportunity for competitors to not just catch up to Amazon, but to leapfrog and win a higher share of future growth. The Whole Foods acquisition was a wake-up call to brick and mortar food retail competitors, and while many are now close to parity with Amazon on same-day delivery, with the right strategic approach these competitors can win against Amazon. Shoppers look for different benefits depending on the shopping mission they’re on. To meet these different demands, brick and mortar grocers offer a range of in-store experiences, from abundant fresh sections for the weekly shop to standardized center store shelves for specific recipes to customer service and take-home prepared foods for tonight’s dinner. Amazon offers a one-size-fits-all food shopping experience: single pages for individual items, identically formatted. Consumers add to cart, then checkout. But food shopping is not about single items. It’s about abundance, comparison, choice, being reminded (and tempted), sampling, being with others, the thrill of a bargain and more. Amazon’s frictionless experience thus leaves much to be desired. From a survey conducted among 3,000 nationally representative grocery shoppers, Amazon trails competitors across key benefits sought, in each shopping mission. Define your shopper’s missions, and prioritize where and how to win. Food shopping offers too many potential experiences to create for shoppers, and no single retailer or format can successfully offer them all. “The Everything Store” is not what any shopper wants for a specific food shopping mission. To create a compelling reason to shop with you, define the landscape of your shopper’s missions, the key benefits sought, each mission’s size and attractiveness and determine where you have the right to win. Disrupt today’s standard (and sub-par) online food shopping experience. Rather than over-investing in in-store technology and displays, focus on the still-developing e-commerce experience. No one has effectively moved beyond the standard online shopping experience. Another challenge to be solved is the impulse buy, which is critical to basket-building. In the drive to frictionless shopping, what can replace the productivity of endcaps, or the pack of gum in the checkout line? A whole new online food shopping experience must be designed from the ground up. Another key strategic driver of Amazon’s slowing growth in food is weak private brand traction. Mirroring its decentralized, every-team-for-itself organizational model, Amazon has introduced multiple brands across multiple categories, including food. Most of these brands are not clearly related to Amazon – do Happy Belly, Mama Bear or Wickedly Prime make Amazon come to mind for you? – or are even intentionally untraceable. Adding to this confusion, Amazon is now outsourcing private brand development in consumer goods, citing difficulty and high costs. This entrepreneurial private brand model may lead to product innovation in the short-term, but in the long-term it does nothing to differentiate the overall brand as a trusted destination for food shopping. Indeed, there is increasing skepticism around search result rankings and reviews given to Amazon’s private brands. 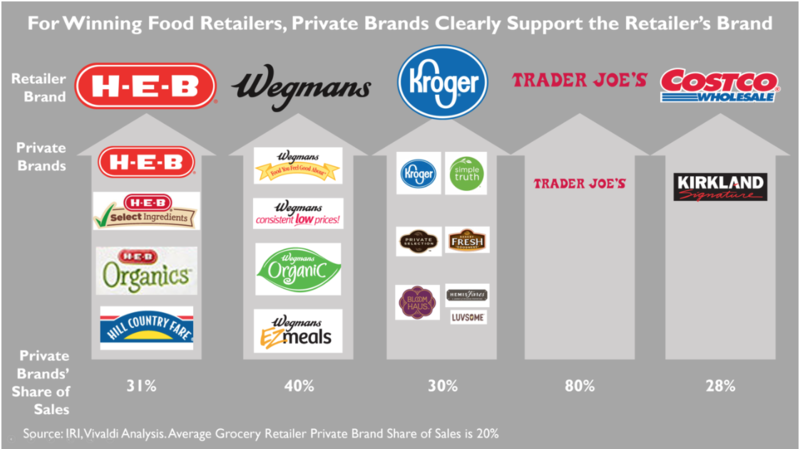 Winning food retailers all show clear commitment to private brands, and have a private brand architecture that explicitly links private brands back to the retailer brand. Private brands can offer tremendous value to shoppers, and can hop into and out of trends faster than name brands. Costco’s Kirkland brand alone is a $39 billion business, bigger than Macy’s and JCPenney’s combined revenues. Create a private brand architecture to support the retail brand. Align your brand portfolio to explicitly support your overall retail brand, and don’t let your portfolio run amok. Every new private brand added must have a clear and incremental role (e.g. targeting a different customer segment) and create tremendous value for your shoppers in order to build loyalty. Commit to private brands, and exercise patience. With astronomical investor expectations, Amazon cannot afford to be patient in building private brands. Competitors can press this advantage by committing to long-term, sustained private brand building efforts. The higher margins that private brands provide will also be critical in the future with more sales going to e-commerce, where shipping costs dilute profitability and pricing pressure is extreme. Solve online challenges for private brands: Private brands depend on conversion at the shelf, with shoppers comparing price and packaging vs. name brand alternatives. With today’s online shopping experience (one page showing one item) this conversion and comparison does not happen. Retailers must innovate their e-commerce experience to highlight their private brands’ compelling value. What exactly is Amazon’s brand in food? What should customers expect, and why is that proposition better than a competitor’s? Outside of food, Amazon’s brand is all about raising expectations (a.k.a. “The Amazon Effect”) and numerous rankings put its overall brand in the lead among consumers. Amazon’s brand has developed incidentally, on the strength of its execution and customer experience, rather than an intentional statement of the brand’s promise. As the data above shows, however, Amazon badly underperforms other food retailers on key benefits. And those competitors are catching up to Amazon on delivery with additional pickup options, while new technology may leapfrog the ‘Amazon Go’ store concept entirely. Amazon’s food brand is fragmented across multiple destinations – Amazon, Amazon Fresh, Amazon Dash, Prime Pantry and other sub-brands. Amazon today does not declare a promise in food. Amazon’s unspoken food brand aspiration seems to be democratizing Whole Foods, but it’s not clear how in-store and online come together in that proposition – or whether the Whole Foods shopper is willing to give up a selection of smaller, local brands. Further muddying its food proposition, Whole Foods is now reported to be raising prices above cost-of-goods increases, rather than reducing them. Realize that you only have one brand, and it is a major asset. Shoppers want to trust one brand. Retailer can rarely afford to support multiple sub-brands – or afford to fragment their customers’ attention and awareness. Stand for one thing, not “Everything”. While in the past a food retailer’s brand could succeed just by executing on the basics (quality, selection, service, convenient location, etc. 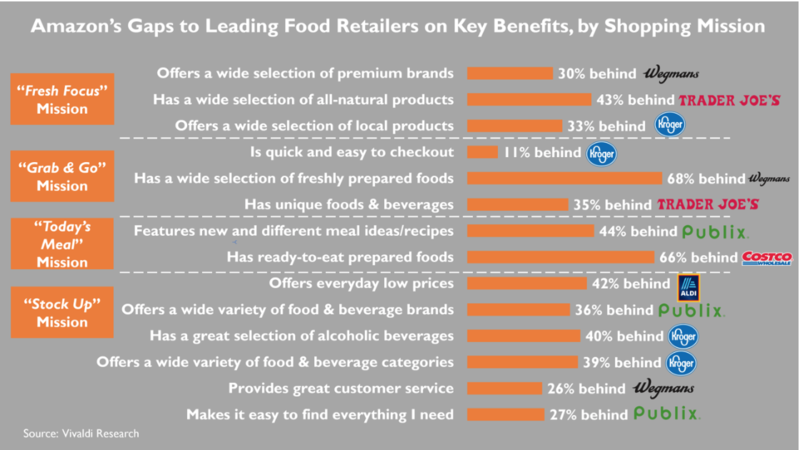 ), food retail brands now need to win on a specific set of benefits. Decide and commit to a specific promise. Pete Killian is a Partner at Vivaldi. 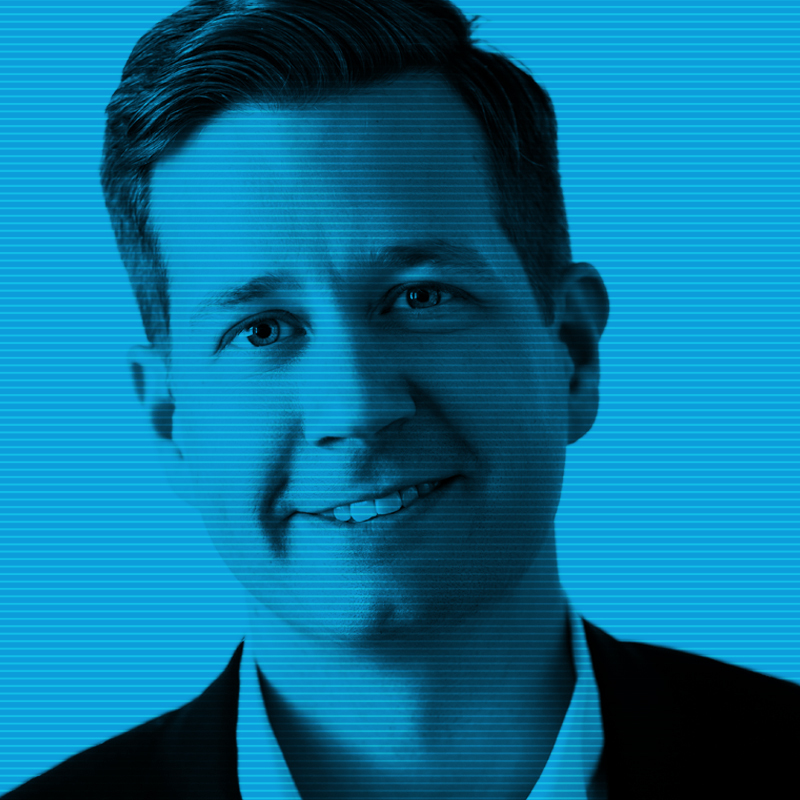 Pete brings over 16 years of experience in strategy consulting and is a published thought leader on growth. At Vivaldi, Pete works with clients to develop and execute customer-led growth strategies with a focus on retail and CPG.